Asparagus season is getting longer in this inter-connected world. I see packages of fresh asparagus at my supermarket in Western New York from spring all the way into late fall. 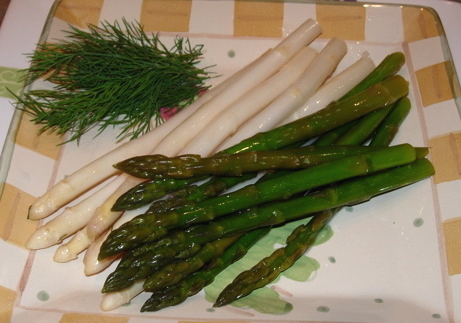 Asparagus is a star ingredient in vegetable fermentation. It rocks with a pickled flavor that marries well with many existing pickle classics – like dill pickles. It’s even faster than using cucumbers. Most people don’t realize asparagus can be fermented in raw form, yet it tastes “cooked” and succulent. I think I like it best in pickled form. What’s more, there is very little prep time. Rinse whole asparagus, and then simply take a clean one-quart jar. Measure one length of asparagus to fit within the jar. It should be 2-inches shorter than the jar lip. Use this as a template and cut the rest of the asparagus to length – or it’s fun even just to snap them. You can also make this a beautiful floral display in the jar, especially if you want to give them as gifts. If your taste for garlicky dill pickles can not be sated with out-of-season cucumbers, but asparagus is looking good, then this is the recipe to make. We simply use our recipe for garlicky dill pickles and do the same thing except switch out the cucumbers for asparagus. Use fresh garlic. You can decide if you want to mince these or leave them in slices, they both pickle nicely. One nice thing about garlic is when it is fermented it becomes mild and not so aggressive. Go ahead and add some of the garlic, and add your asparagus in. I like to stand it up and create a space for the dill to go so it sets in the jar nice and is attractive. One of the tricks of dill is that if you just pound on the stems a little you will get a little more of the dill flavor out. DIRECTIONS: Use a fermenter of choice to seal ingredients beneath the brine. Make the brine: 2 cups of filtered water and 1 TBS. of unrefined sea salt. Fill the jar up with the brine covering the asparagus, dill, and garlic. When it gets near the top check to see if the brine overflow cup is going to fit. You can add some more garlic on the top. Clean the lip off. Install the gasket into the lid so you have a nice hermetic seal with the Perfect Pickler®. Now the cup will be able to receive the expanding brine (from gas formation during fermentation). Nothing can get back in because we are going to have our fermentation lock in place. Add water to the max line on the airlock. Now it can out gas but nothing can get back in. We are going to seal this little devil up and in four days at room temperature, we are going to be eating some pretty serious asparagus! You will find a new pickling mate in asparagus. The texture holds well over time. Add a few spears to a salad, or to an antipasto plate.